A new four-part event is planned for Teen Titans and Deathstroke. There is a history between the characters which sets up the crossover event. It will be entitled “The Lazarus Contract,” and comic writers Benjamin Percy and Dan Abnett are stepping up to script the series. In part one, Deathstroke discovers that Wally West, the former Teen Titan, holds the key to bringing his son back from the dead and he resolves to stop at nothing to do just that. 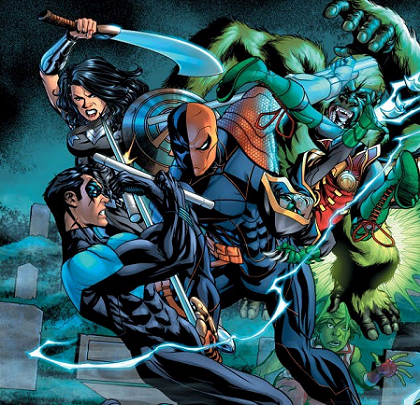 Two separate Teen Titan teams that have existed since the rebirth chapter began and they will be uniting in opposition to counteract whatever plot Deathstroke is hatching. Deathstroke first appeared in The New Teen Titans in 1980 and has become an antagonist several times for the super group since then. In 2010’s Titans: Villains for Hire, during the Brightest Day saga, Deathstroke returned with Osiris and a team of super villains to confront the Teen Titans. Now the background history is center stage as Slade Wilson is determined to find a method of resurrecting his son Grant and believes Wally West is his answer. An artist team is creating the illustrations, who include Brett Booth, Norm Rapmund, Paul Pelletier, Khoi Pham and Mike McKone among others. The four comics will be published in May, Titans #11, Teen Titans #8, Deathstroke #19 and Teen Titans Annual: The Lazarus Contract #1.